If you want your four wheeler to perform well, and for you to enjoy safe driving, it is important for you to use good quality original replacement parts for your vehicle. Original parts are made for the specific vehicle model and should fit perfectly. Original parts are durable and if well maintained, their lifespan may be extended. Replacement parts that are not original may be cheaper but they are of substandard quality and may not last long. In the long run, you spend more to get the parts replaced more often. What are OEM parts? OEM stands for Original Equipment Manufacturer. It means that the part was made by a company that is a subcontractor to an auto manufacturer. It is not necessary that only a vehicle dealership carries the best OEM parts. In fact, you can get the same type of parts made by the same company for less money from elsewhere than from the dealership. 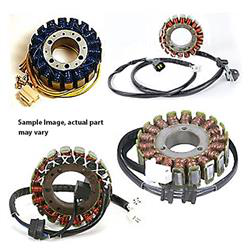 There are online bike websites selling OEM ATV parts for top brands such as Honda, Kawasaki, Yamaha, Suzuki, BMW, and many others. Choosing good quality tires could be challenging if you do not know what to look for. There are good quality tires that are priced reasonably and need not burn a hole in your pocket if you know what to look for. Selecting the wrong tires can decrease your vehicle’s performance, kill your fuel economy, and possibly damage your ATV. Mud Tires have very tall tread patterns with large voids between them. As the tires spins through the mud, the mud is forced from the centre section of the tread pattern and pushed outward to the sides. The faster the tires are spun, the better this function works. Mud tires are not suitable for hard packed trails. Trail tires are also known as “all-terrain” tires and are designed to handle a variety of terrain and offer a good range of traction in various terrains although they may not excel at any one terrain. The tread pattern on “all-terrain” tires typically have overlapping tread patterns with small gaps between the tread lugs than mud terrain tires. These tires offer better lateral and vertical stability than most other tires, and will provide longer tire tread life than mud tires. Sand tires are characterized by their “scoop” type treads. The front tires typically have only one tread pattern i.e. is a raised rib, running down the centre of the tire. This is the only tread pattern that provides good traction in the sand. Sand tires are not suitable for mud trails or on the street. 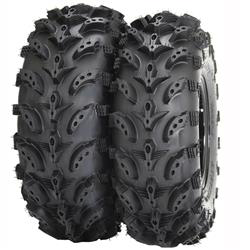 Racing tires are specially designed and built for medium to hard packed trails and racing courses. They are characterized by their flat-top, knobby construction, and are designed for high-speed runs.